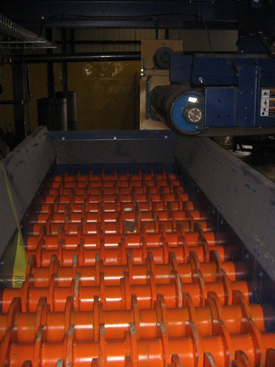 Our glass breakers are used mainly in plants that treat selective collection residue (blue bin, PVM or "single stream") or treat containers only. Strategically positioned in the treatment process of these materials, our glass breakers make it possible to remove the maximum amount of glass found in the processed materials. The pieces of glass are mechanically broken thanks to powerful triangles mounted in series on rotating shafts. Small openings between the triangles allow the small pieces of glass to fall through. When the mixed material falls on these moving shafts, the glass pieces shatter against the superior hardened steel and once broken fall through the openings between the triangles. determined by the type of material treated and the treatment capacity desired. By removing the glass with our equipment, downstream machines wear at a slower rate and work longer (wear on belts, different sorters, balers, etc.). Thanks to their simple design, our glass breakers can easily be integrated into existing plants and processes. They are also equipped with safety guards for moving parts, and they meet basic OSHA standards.